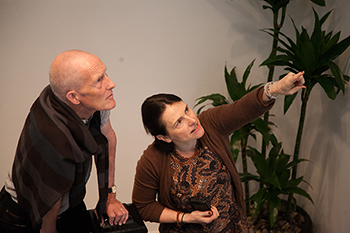 A perceptive visitor to the Sainsbury Institute may have noticed the large Parinirvana painting depicting the Death of the Buddha on display at the Institute. Hung prominently in the entrance hall soon after the Institute moved into 64 The Close, the late 18th century painting came as a gift from one of the most esteemed scholars and social anthropologists of this country, Sir Raymond Firth (1901-2002). Professor Sir Raymond lived to be a hundred. He passed away shortly after bequeathing the painting together with some rare books to the Institute, and unfortunately never got to see the restored painting placed on the Institute’s wall. 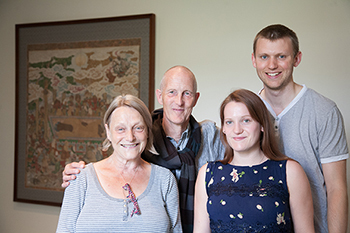 It was therefore a particularly delightful occasion to welcome his son, Dr. Hugh Firth, together with his wife Dr. Melinda Firth, daughter Emma and her fiancé and their friends to the Institute in July this year to see Sir Raymond’s legacy created well over a decade ago. For the Firths, the visit revealed an intriguing story about Sir Raymond. 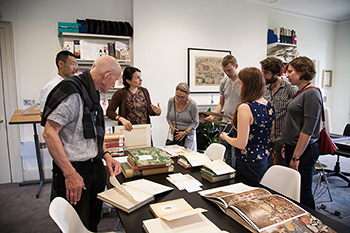 The Emeritus Professor of London University through his friendship with Steven Hooper, Director of the Sainsbury Research Unit for the Arts of Africa, Oceania & the Americas, offered Steven’s department some Pacific objects and books. He also offered the painting, but as it was from Japan, Steven introduced him to Professor Nicole Coolidge Rousmaniere, who in 1998 when she was lecturer at the University of East Anglia’s then School of World Art Studies and Museology. Parallel to her teaching role, Nicole was embarking on creating an institute dedicated to the study of Japanese arts and cultures. 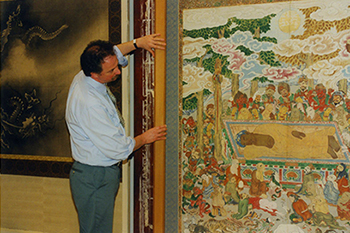 Upon learning that the Sainsbury Institute would be housed in the Norwich Cathedral Close, Sir Raymond bequeathed the large Nehanzu hanging scroll and a small collection of rare books and prints on traditional Japanese cultures and customs to the Institute. Although small in number, Sir Raymond’s book collection on Japan was interesting, as they did not reflect his main research interests, which were primarily Tikopia, Malaya, New Zealand – and, indeed, England . In fact, Sir Raymond never looked at Japan as a research focus. Sir Raymond was, however, known for his insatiable interest in all cultures, and it was his inquisitive nature that led him to these small acquisitions. Sir Raymond was the son of a Methodist builder in Auckland. He trained in economics before moving to England in 1924, meeting Prof. Bronislaw Malinowski and pursuing his interest in anthropology at the London School of Economics. In 1928, Sir Raymond made his first fieldwork trip to Tikopia, a tiny Polynesian island located in the Pacific Solomon Islands, which led to a lifelong interest and attachment with its people and nine books on the subject. He spent a short time in Australia at Sydney University but later returned to the London School of Economics where he taught as Professor from 1944 until his retirement in 1968. His first experience with Japan was indirect. In 1939, he and his anthropologist wife Rosemary were planning to conduct fieldwork in China, but the trip was made impossible owing to Japan’s invasion of China. Instead of traveling to their original destination, they instead carried out their fieldwork in Malaya (part of present day Malaysia). Raymond did eventually visit Japan where, he met and became friends with the eminent scholar Nakane Chie, subsequently the first woman Professor at the University of Tokyo. Sir Raymond, who also enjoyed French and Italian Romanesque art and architecture, apparently collected books on Japan as part of his broad interest in all human social behaviour. Through examining the Nehanzu scroll, and the books and prints on Japanese customs—especially on death rituals—both Hugh and Melinda were again struck by Sir Raymond’s desire to learn about all social cultures, including the art and culture of Japan. Hugh also remembers how the large scroll hung prominently in his father’s office, but was quick to note that it was not framed as it appears today. 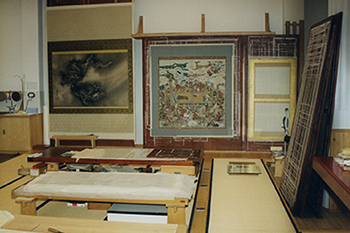 When the scroll was received, Nicole explained, full conservation work was carried out at the Hirayama Studio in the British Museum. There, the original aged backing was replaced by a new support made from washi paper. Nicole points out that the scroll looks ‘fresher’, as the colour of the new backing paper peering through the silk weaves makes the painting and its polychrome pigments appear more vividly. She also explained that the Nehanzu would be hung only on special occasions and was not intended for prolonged display. But as the Institute wished to keep the painting on permanent view at Sir Raymond’s request, the painting had to be framed under special light protection glass to offer maximum support and conservation. The Firths were shown the 23 books and a series of prints by the librarian, Hirano Akira, who looks after the Firth collection. He prepared the books, which are all on traditional Japanese culture, in thematic order. They include writings on Japanese literature, samurai culture, and art and artists, including a book on drawings and woodblock prints by Fritz Loewenstein written in German: Sir Raymond read German fluently. Each book has his ornate but simply rendered bookplate designed soon after his knighthood in 1973. The bookplate includes a representation of the New Zealand fantail, and a stylized image of a bird from Tikopia. What most intrigued the Firths was a series of images mounted as individual prints from the bookSketches and Japanese Manners and Customspublished by Day and Sons, Limited in 1867. Compared to the plates found in the original book, a copy of which is in the Lisa Sainsbury Library’s Cortazzi collection, Sir Raymond’s series consists of 15 illustrated plates out of 27 in the book. The coloured fac-simile prints each present a scene of traditional vernacular and ritual culture of the country. Whether Sir Raymond chose 15 images that particularly appealed to him or whether he bought what remained with the seller is unclear. What is noticeable, however, is that his images primarily concern the life of the ordinary townsmen instead of the courtly rituals and ceremonies of the aristocrats. He seemed particularly drawn to Japanese funerary and judicial processes. There are a set of images depicting the funerary stages beginning with a funeral procession, scenes of a cremation, ash and bone collection and remembrance rituals held for the parted soul. There are also unusual images that convey scenes from a criminal prosecution, a sentencing, and a ritual disembowelment. Sir Raymond’s granddaughter Emma was as intrigued and delighted by these illustrations of 19th century Japanese culture as her grandfather would have been: an interest in the behavior and rituals of other cultures which runs deep in the Firth family. The Sainsbury Institute owes much of its success to patrons such as Sir Raymond Firth, who have helped encourage, nurture and support non-Western cultural research in the UK. With gifts such as the fascinatingNehanzu scroll, books and prints, the Institute hopes that the legacy of Sir Raymond’s patronship can be enjoyed by visitors who come to use the library or attend lectures and events at 64 The Close in many more years to come.